JANET: After reading the book, I’ll give my suggestions for illustrations and see if that triggers anything from her. If not, then we may go with one of my ideas. Linda Beutler used my idea for the front cover of The Red Chrysanthemum, and gave her input as I worked. Then when it was time to do the back, she had specific ideas for it. The red roses on the back are not just any red rose but a specific one, 'Slater’s Crimson China' Rose. JAN: If the author does have an idea for the cover, what’s the best way she can convey the message to you if she’s not an artist? Do you want to see pictures she’s found that are somewhat like what she wants? JANET: Yes, I do. Some of those pictures can have things added or taken from them. In other words, pick and choose what we want. Anything that helps me see what the author is visualizing is helpful. Suzan Lauder sent me lots of paintings of ships for the cover of Alias Thomas Bennet. As we progressed, she decided she wanted a man with two children waiting for the ship, which definitely tied into her story. I did a lot with colors on that cover to get the feelings/mood to match the scene. JAN: I’m fascinated by the process you go through to arrive at a finished drawing. I only had one absolute in mind with my latest book. I wanted a beach scene at the ocean with a big rock because it played an essential part in The Secret Betrothal. I thought I wanted it on the front, but then I considered the reader. What would the ocean have to do with a secret betrothal? So, I decided I wanted the three characters that made up the triangle on the front, and we put the beach scene on the back. 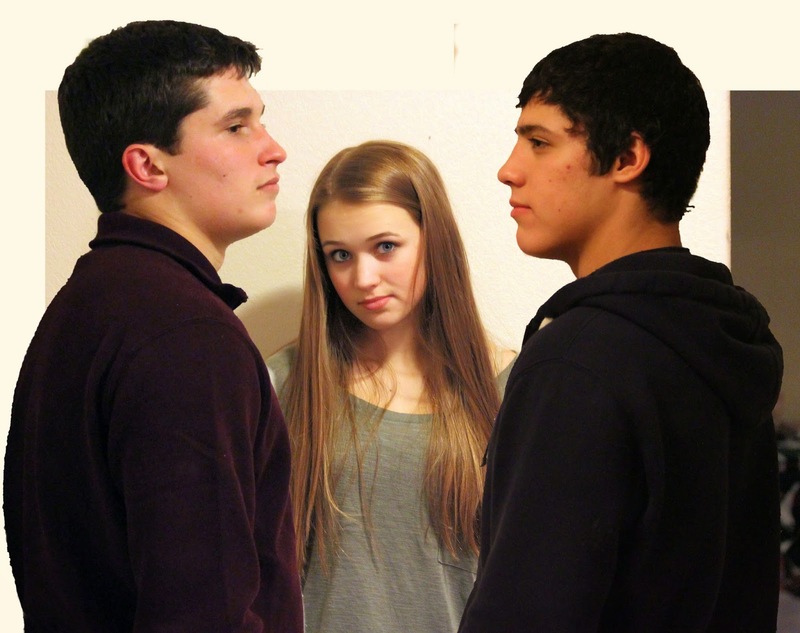 Elizabeth standing between her two suitors was about all I told you, Janet. 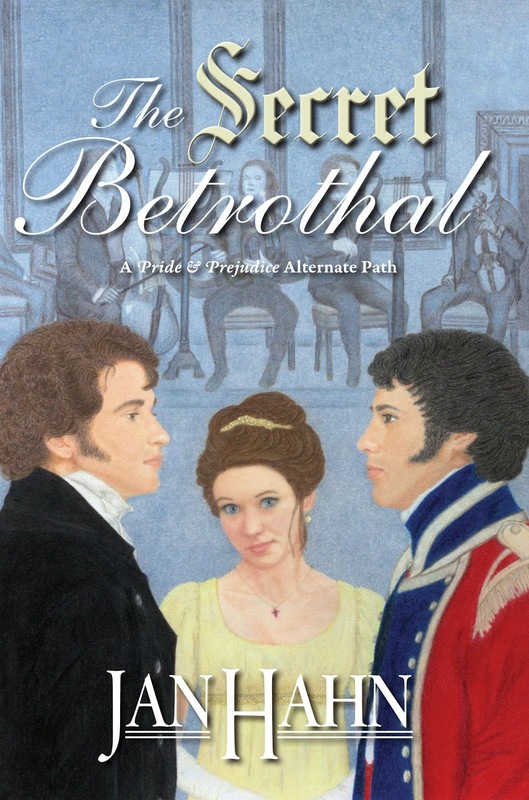 Can you tell us how you created the front cover for The Secret Betrothal? JANET: The book has three significant balls in it, so we knew a ballroom was a fitting place for the three characters to be. We talked about various ways you wanted them to stand. Should Elizabeth be standing in front or beside the men? Should the men be looking at her or each other? In the pic to the right, he has a slight smile or smirk. made this pic a keeper. The look on Zach's (Wickham) face was perfect. give a better idea of the planned drawing. Like most artists, I need something to look at when I draw. In the past, artists needed models to sit for them. Today, however, we have the luxury of photographs. 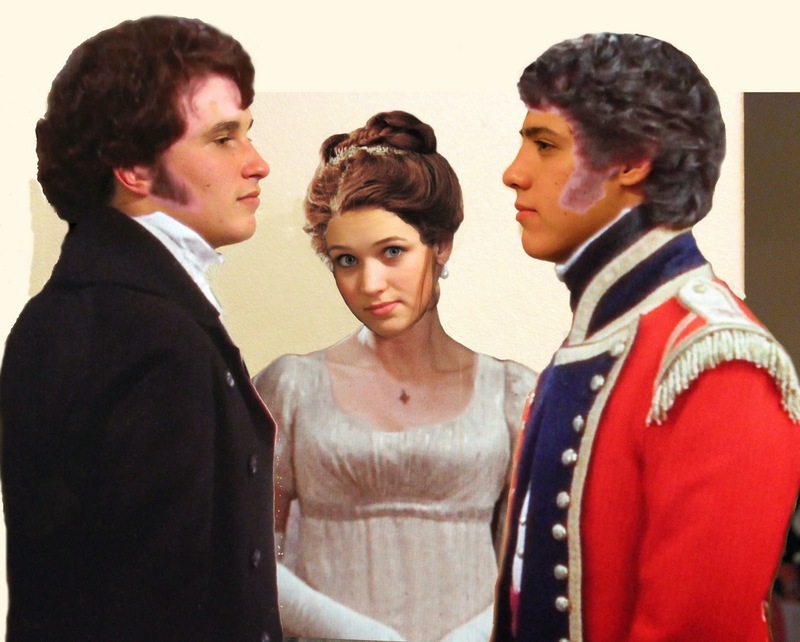 Since you suggested my grandson pose as Darcy and he had some friends who could be Wickham and Elizabeth, I asked them to be my models. Because they’re teens, the hardest part was getting their schedules worked out so they could all three be at my house at one time. I tried to pose them together, but they dissolved into laughter so often that I gave up on that idea! I ended up doing individual shots. I told them how to stand and what I wanted them to think about to get the expression on their faces that I needed. I literally took at least a hundred pictures of them. Then I spent hours sifting through the photos to find just the right three. On the computer, I cut out the background from each individual picture and placed them together the way I thought you wanted. After your approval, I then found pictures of period clothes and placed them on the models, via computer, to get an idea of what might need changing before I began drawing. Once drawing commenced, I had to age the guys, take out the roundness of their chins and square their jaws. I gave the guys sideburns, added shadows of beards, and changed Elizabeth’s hairstyle. You suggested a simple background in subtle shades of blue, but I felt like it needed something more, so I proposed the idea of an orchestra. You did not want the orchestra to be as prominent as the three main characters, so I let their feet shade out and kept the color muted. That’s when you thought they looked like ghosts! I also only drew three musicians at first, but more were needed to fill out the picture. Then I went back to the drawing board, added more color to the feet and legs, put in a floor and several more musicians with their instruments. JAN: How can the author and artist avoid misunderstandings? I know we had a few even though we’re friends, see each other often, and talk on the phone at least once every week. 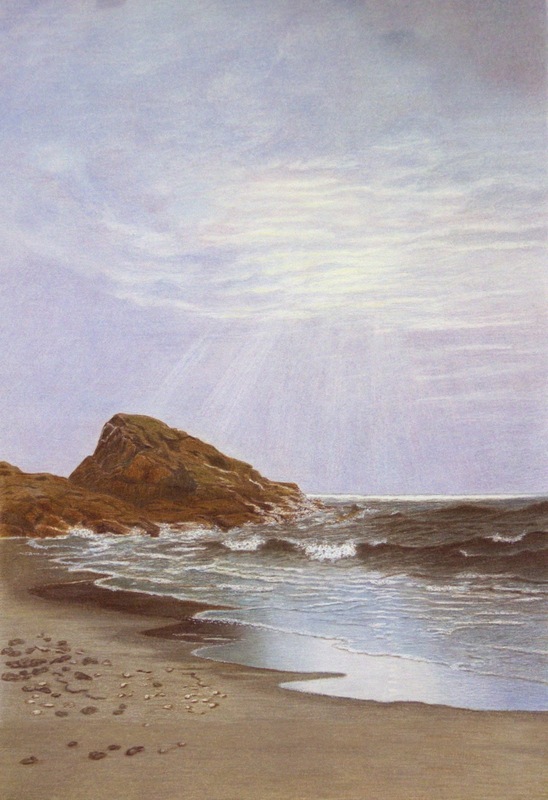 On the back cover, we had looked at various paintings to get ideas for the beach scene and large rock that you wanted. I got it partially drawn and decided to show you what I had done so far. Big mistake! What you saw was completely different from what I saw because I knew where the drawing was going, and you didn’t. Where I saw a rock and sky, you saw a mountain! That’s why most of the time I don’t show the picture to the author until it’s finished. I guess it's a bit like you showing someone a few chapters of your book or the beginning and ending without the middle and expecting the person to know where you are going with the story. JAN: How late in the process can you change a drawing? JANET: That depends on what part of the drawing the author wants to change. Some things I can alter and some I can’t, depending on the colors and pigments or how major a change is involved. Some things can be adjusted on the computer like noses, lips and/or tweaking the colors. Sometimes I even clone something from another part of my drawing. A good rule is if you want to make changes, tell the artist as early as possible. I will tell the author if it’s something I can change or not, or what I can try to do. For obvious reasons, lighter colors are more conducive to change than darker or brighter colors. Most importantly, do discuss it. After all, it is the author’s book and the cover is just the visual representation of it. JAN: I know you’ve done original covers for Meryton Press authors. Are you available to other writers, or are you under exclusive contract with Meryton Press? Besides original drawings, do you ever do graphic design work for authors? JANET: First of all, I’m not under contract with Meryton Press. Each cover is contracted separately. I really enjoy working with Meryton Press writers, but I enjoy working with other authors as well. I also do graphic design for covers where I combine stock photos or parts of paintings that are in the public domain to make a new and completely different picture. I recently did two front covers for author, Cassandra Grafton. Both covers are made up of parts of several pictures that I have put together to make a new picture. I then turned the new picture into an oil painting. You can view them on the Cover Art page of this blog. In the near future, Ms. Grafton will be posting chapters of Lizzy Bennet’s Diary with both of the above mentioned covers at Austen Variations. JAN: I thoroughly enjoyed our collaboration on the front and back covers for The Secret Betrothal, Janet. Since I know nothing about art other than what I like and don’t like, it was a learning experience for me. I believe the most important thing for artists and authors is frequent communication. You do beautiful work, and I’m very proud of the cover art on my latest book. JANET: Thank you, Jan. I enjoyed working with you on your covers and felt it was quite an honor to do so. You are right about the importance of communication. As much as we talked about the pictures and cover ideas, we found there could still be miscommunication. I think that was a surprise to both of us. It takes time and patience to put everything together to achieve that final desired goal, a cover that stands out and grabs attention. I’m so happy that you are proud of your cover art. That makes it all worthwhile. Thank you also, for being my guest today and interviewing me. That put a fun twist to the post! 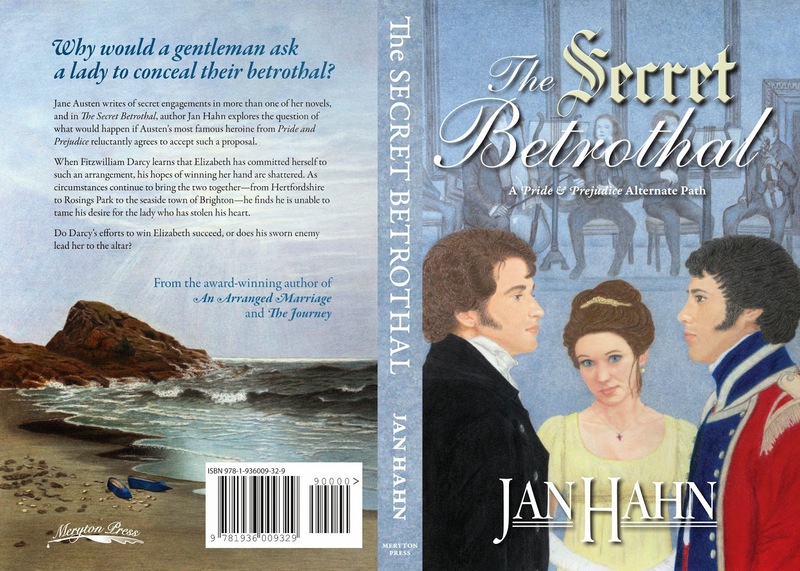 Jan Hahn is generously giving away The Secret Betrothal to two lucky people. A domestic winner will have the choice of a signed paperback or eBook. An international winner will receive an eBook. To be entered leave a comment below as I always love reading your 'share in the conversation'! Good luck to all. Be sure to include your email address in the comment. To prevent unwanted spam, put your email address with (at) instead of @. Winners will be chosen in a random drawing. Giveaway will end at midnight, April 17, 2014. Thanks Tina. It was much fun doing the cover. I hope you get to read the book soon. I agree, Tina. I was amazed at Janet's process. Good luck with the giveaway and thanks for your comments. What a wonderful twist you gave us for this interview. Great idea with excellent information. I already have the book and read it the same day it was released. It was a fun read. Jan, you already know that I am a fan, so I look forward to more from you in the future. Please enjoy your tour. Janet, was this information not perfectly timed? I love your work as well. Yes, Joy, the timing for the info is perfect! Hope it helps and I'm thrilled you love my work! That makes my day! Thank you, Joy, for your support. And Janet is a treasure! I love seeing how the cover art came about. It has to be hard to see things the way the author does at times. I am looking forward to reading this book. I have been wanting to read it since I first saw the cover release. It is often difficult to see what the author is seeing. It helps to read the book first but still, everyone sees things differently. I hope you get a chance to read the book. I loved the story. A great cover attracts readers, and that's why it's so important. Thanks so much for your comment, and good luck with the giveaway. Very interesting reading your process, Janet. Congratulations to the both of you! I'm glad you enjoyed reading about it, Kara Louise. It is great to have you visit today! Thanks for taking the time to comment. The back cover was a new experience for me but it was fun trying to make the sand look wet and the water shine from the sun peeking through the clouds. I'm happy that you like it, Susan. I appreciate you stopping by. Good luck with the giveaway. I love the back cover! Once I recovered from my fear that the rock was a mountain, I found Janet's idea perfect. Thanks for your comments. Thanks for sharing the process with us, Janet, it was fabulous to read about it and especially to see how your grandson and his friends were gradually transformed into the characters. So beautifully and skillfully done!! You are very welcome. (as my 2 year old granddaughter would say) Thank you for the wonderful compliments too! You made my day. So good to hear that you love the book. I do too! Thanks for all of your support. Thank you, Joana! I appreciate your kind comments. I've always wondered about this side of getting a book ready and book covers are part of what draws me in. I love that there was so much concern to get this right with the story since its always so disappointing when a cover has almost nothing to do with what is inside. I'll bet your grandson and his friends feel important and can now brag that they're cover models. Haha! Congrats to both of you ladies on the collaboration for this book. Thank you for the giveaway opportunity. Yes, Sophia Rose, you got it right. My grandson and his friends have felt pretty important being on the cover. They have been pretty cute with their comments. They have actually been much more excited than I expected. Zach (Wickham) plans to read the book. (I am giving them each a book signed by Jan.) Thanks for your comments and good luck with the giveaway. Janet's grandson is a sweetheart! I haven't met the other models, but I'm so glad they were willing to be models. Thanks for stopping by, Sophia Rose. Marti, glad you enjoyed the interview. Jan came up with some good questions, didn't she? I think it is so neat that you want to have a display at the library and an article in the paper. That would be nice. Thank you for your thoughtfulness. Good luck! Thanks, Marti, for your comments. I hope you're able to get your library to display Janet's work. It's wonderful! What a fun twist Janet, to be the interviewee instead of the interviewer. This topic was a good one. I have truly enjoyed watching your drawings/artwork grow and change with each new cover, calendar, canvas and so on. You are a very talented artist and I look forward to seeing your future work as well as reading the stories held inside! Jan, I can hardly wait for your next book.... I'm addicted!!! It was a fun twist! I enjoyed switching places! :) Thank you for your sweet comments and your support. It means much tot me. I'm ready for Jan's next book too! I'm already pushing her to start!!! Ha! Thank you, dear Christina! I think I may have one more book up my sleeve. I'm wowed by the transition from the original photo to the artwork. It's so cool! Now I want to see the models for the "Alias Thomas Bennet" cover! Nice work, Janet. Have fun on the blog tour, Jan! Thanks, Suzan. Sometime I will send you the photo of my son, granddaughter and baby doll that I used for my model for your front cover! It looks very different from the finished cover too. Thanks for stopping by, Suzan. Thanks, Suzan, I'm having a ball! It is interesting to Know How you made the cover. I Always think it is a very important part of one book. Thank you for the giveaway. Thanks for your comments, Chiara! Good luck with the giveaway. I love book covers so it has been much fun for me to get to do some of them. I'm glad you enjoyed reading about it. Good luck with the giveaway. Thank you Janet and Jan for a very interesting article. As the editor for both Linda and Suzan, I was fascinated learning how those covers came about. I'd love to see that picture too! And I can't wait to read Jan's latest. I've loved all her books and she is one of my favorites! Oh, thank you, Gail! That means a lot coming from you! I'm glad you enjoyed the interview, Gail. It is a fun process getting the covers just right. Someday, I'll show you the picture too! 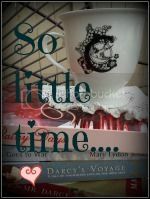 :) I know you will love this latest book by Jan too. She is also one of my favorites! She thinks it is just because we are friends but in truth, it just makes our friendship easier! lol Can you imagine if I didn't like her stories? Now that would be tough! Since I love all of Jan's stories and am very familiar with Janet's artwork, I would love to have the book for both the contents and the cover! You ladies rock! I know this book will be a hit. Thank you, dear friend. You've been such a support to my work for years and years, and you have no idea how much I appreciate it! Thank you, Sandy. You are a special lady and I appreciate your kind words! Good luck in the giveaway. Thank you very much for such interesting interview! I was quite ignorant of the work of book cover design artists, so reading the interview was very enlightening:) I find it fascinating getting to know the peculiarities of work process of creators. Thank you for your comments! I learned so much from Janet while working together. It was a great experience. Glad you enjoyed our interview. Thanks for stopping by and good luck. I love your trading places interview. It was very educational to realize the work that goes into book covers, especially JAFF. I love Janet's art! I just finished The Secret Betrothal and enjoyed it very much. Jan, I believe you stayed true to JA's characters, which is very important to me as a Janeite!! Thank you, Catherine! That means so much to me coming from a fellow Janeite. Oh, Catherine. You make me feel so good! Thank you very much. Glad you enjoyed our post and thrilled to hear you loved Jan's book. I thought it was awesome. Thanks for enlightening us on the process of developing a book cover art. It was really interesting and not easy to accomplish what you did but I do love it. I save Austenesque book covers and can say that this is certainly unique among all the covers. Since I'm international, please enter me for the e-book giveaway. Thanks a lot. What great collectibles - Austenesque book covers! And I agree, Janet's covers are unique. Thanks for your comments! I'm glad that you do, Sylvia. The idea of saving Austenesque book covers is fantastic! I bet you have some wonderful ones. All I can say is waw! I love your work! I also make some graphic art at my pc but I'm definitely not at your level! Thank you, Loren and Jan! Most of it is done with softcore prismacolor pencils. Then the finishing touches and 'fixes' are done on the computer. I only 'wish' I could do graphic art from start to finish on the computer so you may be way above my level! Loren, I need your contact info from the last giveaway. You are one of the winners. Please email me. Have you ever try to use a graphic tablet to draw directly on the pc? I agree Loren! I'm constantly amazed at what Janet can do. That was a great read, Jan and Janet! Loved the interview tables being turned ;) but really enjoyed the 'conversation' between you over how things came about and thank you for sharing the difficulties as well as the pleasures! I have the book in front of me on my desk so I'm looking at all the details I missed (loving the ballroom setting and the 'greyed out' orchestra. The back cover is just divine, such beautiful artwork and the colours are gorgeous. The models did a wonderful job and it's so interesting seeing how those individual pictures (loved that they couldn't stay straight-faced long enough to have a group shot done!) transitioned into drawings in full period attire. No need to include me in the draw - as you can tell, I have the paperback already! Thank you, Cassandra, for such great comments! And I agree wholeheartedly about the second choice! Cassandra, it was so much fun working with my grandson and his friends. They had me laughing almost as much as they were. I'm glad you enjoyed our interview and discovered those details mentioned. Thanks for your comments and compliments on the covers. Fascinating to learn how artist and author collaborate on the cover art. Sometimes (though certainly not with Jane Austen Authors and their work) one does wonder if the artist ever read the book as the scene depicted seems so random. I know what you mean! Thanks for your comments. We had a good time collaborating on the covers. I think reading the book before doing a cover is a must for me. I need to get the feel and the mood of the story. It's fun to learn more about how cover art comes into being. It's an important thing to set the right tone and be an accurate reflection of the story. Plus I'm super-envious of people who can draw or paint well. I think it's great that you used your grandchild and friends for the models! Definitely looking forward to reading this book, and I thank you ladies for the giveaway. Thank you for your comments, Monica! I'm just as envious as you are of those with artistic talent, but I certainly enjoy some of their work. Hi Monica! Thanks for your kind words. Believe me, I had a ball working with my grandson and his two friends. They all wanted me to make it look like them if possible and the drawback to that was it took me more time. It was fun though and I'm glad I had the opportunity to do it. Good luck with the giveaway. I hope you get a chance to read the book soon. What a lovely idea to switch places! I thoroughly enjoyed reading this interview! Janet, you did a wonderful job. I didn't know you drew other covers! They're beautiful :) It was very interesting to see all the work behind a book cover. Thank you and also thank you Jan for this giveaway! I'm so happy that you enjoyed reading our interview, Maria! We both had fun doing it. I have only being doing some book covers for about a year. It has been such a great experience for me and I'm thrilled that you like them. That makes my day! I hope you get a chance to read Jan's book. It is an excellent read. Good luck with the giveaway. You're certainly welcome, Maria, and good luck with the giveaway! I loved your interview. Especially loved to see how the photo was transformed into your book cover. Thank you, Marcia. It's good to know you enjoyed it. I'm a visual person so I like to have a picture to look at while I draw. It is always fun transforming a photo to an actual drawing.